I am about to be a Shih Tzu owner for the first time. My beautiful Sophie will come home next week. I'm so excited! I lost my last dog, Jack, an Australian Cattle Dog nearly 2 yrs. ago to a hit and run driver. Both my husband and Jack were struck by a truck and left lying on the road. My husband suffered treatable injuries but poor Jack was fatally injured. A few months ago I started the search for my new bestie and became quite discouraged as most were charging huge fees and seemed to care little about the dog. I tried rescues but was virtually ignored. 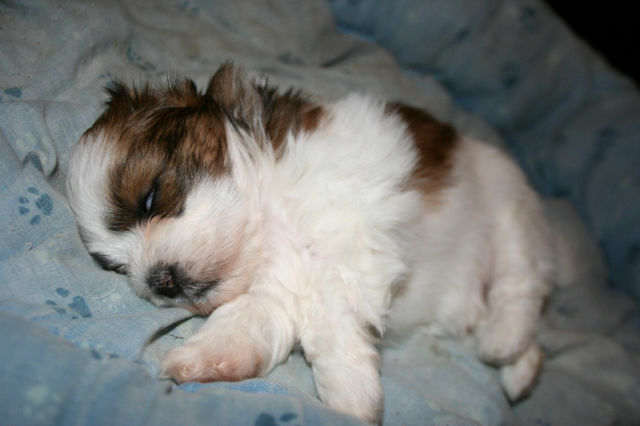 Then, finally, I saw an ad for Shih Tzu x pups. I never would have even thought about getting a Tzu but was instantly hooked when I saw Sohpie. I just new she was meant to share my life. I will share a photo as soon as I figure out how to do it. Hi Cynthia and welcome to the forum, it's great to have you here. You will find plenty of advice on the forum if you need it, but if there is something specific you want to know, just ask away and one of us will try and help. Between us all, we have plenty of experience of the breed. I was going to say the only thing we ask is that you post plenty of photos, but you seem to have got that one worked out already! Sophie looks absolutely gorgeous and I am sure you will be delighted when she comes home to live with you. Shih tzu may only be a small breed, but they have massive hearts and are full of entertainment, so be prepared for lots of fun and mischief over the coming months and years. They are highly intelligent and she will soon have the world sussed out and you well trained! As I said, if you need any help or advice just ask away, and keep posting lovely photos of Sophie as she grows up.